This documents contains the quick facts about the City of San Antonio's Adopted Boarding Homes Ordinance. 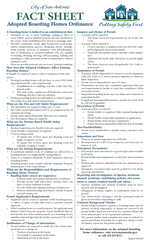 Provides helpful information for knowing what constitutes a boarding/nursing home and associated requirements. 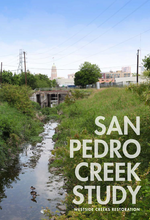 The San Pedro Creek Study is a 100-page document detailing the Westside Creeks Restoration. A highly-useful document that outlines the history of San Antonio's San Pedro Creek and the strategy proposed for making improvements for public safety and quality of life. Prepared by the Department of Planning and Community Development, this detailed document describes the City of San Antonio's Annexation Policy, Program, and Plan.